No, I think I've just been lazy. This is all neither here nor there. What peeves me is that, Channel 4 seems unable to pinpoint where (other than Brooklyn), the story occurred. Brooklyn, like the rest of NY, is made up of a bunch of neighborhoods. Let's start with a look at the photo and caption Channel 4 used on their website. 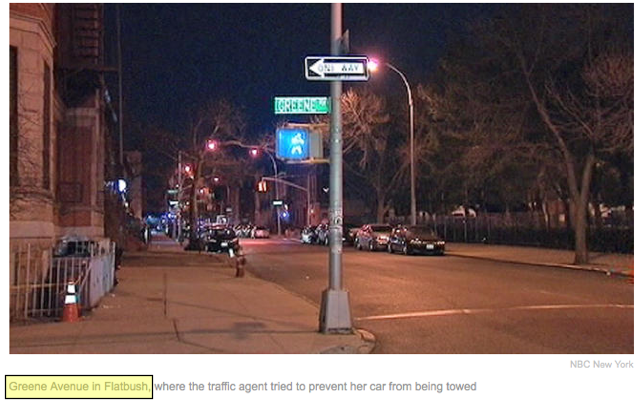 I've highlighted where they say it happened on Greene Avenue in Flatbush. Now, let's go to the map! That blue line running East-West near the top of the map is approximately where Greene Ave is. Then, please note that little pinkish, orange shape near the bottom of the map -- Flatbush. Not even close! But it got worse. They don't have video of the story up, but they kept cutting to interviews with folks about the story (because obviously it's critical that we discover whether or not this might be annoying to the average citizen - average citizens were predictably annoyed), and they kept running little graphics at the bottom identifying the neighborhood variably as Downtown Brooklyn, Fort Greene, and Bedford-Stuyvesant. Two of those are possible while one...is not. 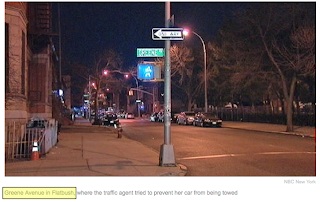 But regardless, I'm pretty sure that since this took place at the location of a parked car, the event didn't travel from neighborhood to neighborhood. 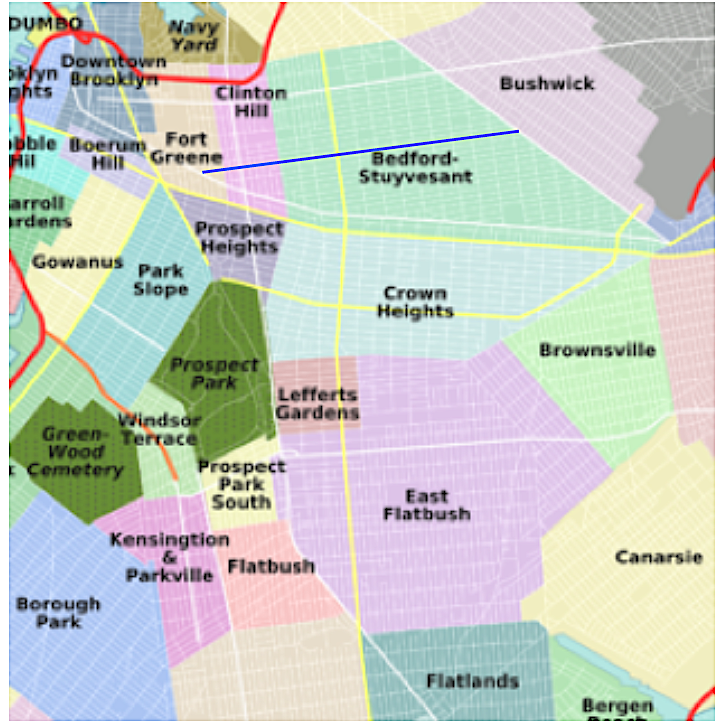 And even if they're unsure of the exact border of a neighborhood, it's not like Ft. Greene and Bed-Stuy overlap each other -- there's an entire other neighborhood separating the two from each other. Granted, this probably doesn't concern anyone who doesn't actually live in Brooklyn, but I kinda expect a local news station to be able to correctly identify local neighborhoods...even if they aren't in Manhattan. It's a little like the Network News talking about a story in Paris and showing you video of Cairo. Somebody's likely to notice. P.S. If you don't, in fact, give a crap about what's annoying me, feel free to tell me what's annoying you today. I won't even tell you I don't give a crap about it. Why is everyone do damned needy today? And why do I have to be in the MIDDLE of solving all these problems instead of out on the edges? Why am I not independently wealthy and able to spend my days as a woman of leisure? Yeah, that would be like something happening on Melrose in West Hollywood, but the press saying it was somewhere around Silverlake or maybe East Hollywood (Hollywood proper lies between West Hollywood and East Hollywood, with Silverlake lying east of East Hollywood). Looking at a map ain't that hard, people. It's those quartz halogen headlights on some vehicles. They're so bloody bright. I drive a Integra which puts my head about three feet off the ground and these idiots in their Ram Chargers (look at the symbol on these behemoths and then tell me what their owners are compensating for) with the "bright-as-the sun" headlights they come up behind me and my dashboard starts to melt due to the shear intensity. Any chance I have of actually seeing anything for ten minutes after they've passed me is about the same chance that Obama has of attracting the fundamentalist vote. Fortunately I tend to speed a lot so I don't get overtaken very often. Which leads us to the sub-idiots approaching with quartz high beams blazing like a super-nova directly in my eyes. They are so intense that an image of my skeleton is permanently embedded in my seat and I see nothing but white blobs for days afterward. These are the guys that need to spend eternity with their Ram Chargers mired in the fifth circle of hell. OK, for Local News a NY network station - #s 2,4 or 7 is the pinnacle, (this is also true for Network news and all three look at Fox as a joke). However none of these people are chosen because of knowledge, but for Q factor and the ability to read a prompter in a mid-west accent. Q factor is essentially acceptability to potential audience and is normally measured by hooking the potential audience up to something that measures, and records, skin resistance. By the way skinny young women with large breasts have high Q factors, so do men with full heads of hair. Murrow and Cronkite wouldn't stand a chance today. Intelligence is a negative here, certain network anchors have been known to insert their own 'facts' in to otherwise well researched scripts. Couple this with the fact most of these people came from some where else and live on the upper west side. And because of the great savings of eliminating the crew, who probably were raised in Queens and Brooklyn, the sweet young thing, has no idea where anything in the outer boroughs is. I have had more than one sweet young thing insist Manhattan is the largest city in the country, because it is New York and everybody knows New York is the largest city in the country. And completely in line with my recent experiences with the news media.